4S. It is a colorless gas with a distinctive putrid smell. It is a natural substance found in the blood and brain of humans and animals, as well as in plant tissues. It is disposed of through animal feces. It also occurs naturally in certain foods, such as some nuts and cheese. It is one of the main compounds responsible for bad breath and the smell of flatus. 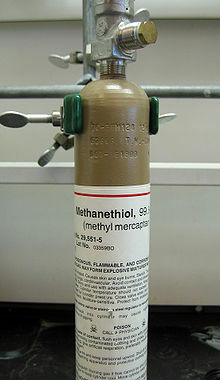 Methanethiol is classified as a thiol and is sometimes abbreviated as MeSH. It is very flammable. The resulting thiolate anion is a strong nucleophile. Further oxidation takes the disulfide to methanesulfonic acid, which is odorless. Bleach deodorizes methanethiol in this way. MeSH is released as a by-product of kraft pulping in pulp mills. In kraft pulping, lignin is depolymerized by nucleophilic attack with the strongly nucleophilic hydrosulfide ion (HS−) in a highly alkaline medium. However, in a side reaction, HS− attacks methoxyl groups (OMe) in lignin, demethylating them to give free phenolate groups (PhO−) and releasing MeSH. Due to alkalinity, MeSH is readily deprotonated (MeSNa), and the formed MeS− ion is also a strong nucleophile, reacting further to dimethyl sulfide. The compounds remain in the liquor and are burned in the recovery boiler, where the sulfide is recovered as sodium sulfide. Methanethiol is released from decaying organic matter in marshes and is present in the natural gas of certain regions, in coal tar, and in some crude oils. It occurs in various plants and vegetables, such as radishes. In surface seawater, methanethiol is the primary breakdown product of the algal metabolite dimethylsulfoniopropionate (DMSP). Marine bacteria appear to obtain most of the sulfur in their proteins by the breakdown of DMSP and incorporation of methanethiol, despite the fact that methanethiol is present in seawater at much lower concentrations than sulfate (~0.3 nM vs. 28 mM). Bacteria in environments both with and without oxygen can also convert methanethiol to dimethyl sulfide (DMS), although most DMS in surface seawater is produced by a separate pathway. Both DMS and methanethiol can be used by certain microbes as substrates for methanogenesis in some anaerobic soils. Methanethiol is a byproduct of the metabolism of asparagus. The ability to produce methanethiol in urine after eating asparagus was once thought to be a genetic trait. More recent research suggests that the peculiar odor is in fact produced by all humans after consuming asparagus, while the ability to detect it (methanethiol being one of many components in "asparagus pee") is in fact the genetic trait. The chemical components responsible for the change in the odor of urine show as soon as 15 minutes after eating asparagus. Methanethiol is mainly used to produce methionine, which is used as a dietary component in poultry and animal feed. Methanethiol is also used in the plastic industry as a moderator for free-radical polymerizations and as a precursor in the manufacture of pesticides. Mercaptan is also used in the natural gas industry as an odorant, due to its ideal compatibility with methane. Its characteristic "rotten eggs" smell is widely known by natural gas customers as an indicator of a possible gas leak, even a very minute one. The safety data sheet (SDS) lists methanethiol as a colorless, flammable gas with an extremely strong and repulsive smell. At very high concentrations it is highly toxic and affects the central nervous system. Its penetrating odor provides warning at dangerous concentrations. An odor threshold of 1 ppb has been reported. The United States OSHA Ceiling Limit is listed as 10 ppm. A severe methyl mercaptan leak killed four employees and injured another in a DuPont facility in La Porte, Texas, near Houston, on 15 November 2014. ^ a b c d e f g h NIOSH Pocket Guide to Chemical Hazards. "#0425". National Institute for Occupational Safety and Health (NIOSH). ^ a b "Methyl mercaptan". Immediately Dangerous to Life and Health Concentrations (IDLH). National Institute for Occupational Safety and Health (NIOSH). ^ Sixta, H.; Potthast, A.; Krotschek, A. W., Chemical Pulping Processes. In Handbook of Pulp, Sixta, H., Ed. Wiley-VCH Verlag GmbH & Co.: Weinheim, 2006; Vol. 1, p 169 (109-510). ^ a b c Norell, John; Louthan, Rector P. (1988). "Thiols". Kirk-Othmer Concise Encylclopedia of Chemical Technology (3rd ed.). New York: John Wiley & Sons, Inc. pp. 946–963. ISBN 978-0471801047. ^ Reid, E. Emmet (1958). Organic Chemistry of Bivalent Sulfur. 1. New York: Chemical Publishing Company, Inc. pp. 32–33, 38. ^ Devos, M; F. Patte; J. Rouault; P. Lafort; L. J. Van Gemert (1990). Standardized Human Olfactory Thresholds. Oxford: IRL Press. p. 101. ISBN 0199631468.